A Pink Christening card for the solemn and happy celebration of a Christening or a Baptism. 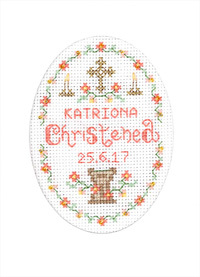 A Pink Christening card with a delicate border with gold coloured beads and a font dressed with blue flowers. 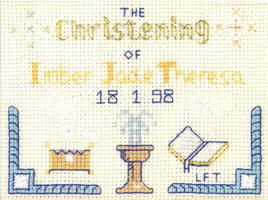 This Pink Baptism card has been redesigned by Lauren Turner for the Decorative Textiles collection. 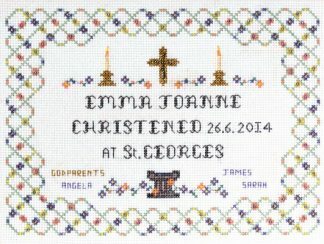 It forms one of the range of christening cross stitch cards and samplers. 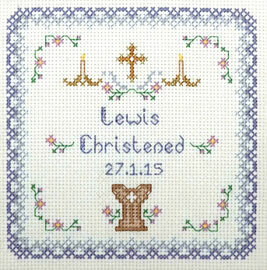 Christening refers to the naming ceremony (to christen means to give a name to). Babies are welcomed to the family of the Church. In the ceremony water is sprinkled on the baby’s head as a symbol of new life and of being washed clean from sin. Parents and godparents promise to bring the baby up in the Christian faith following the example of Jesus Christ.